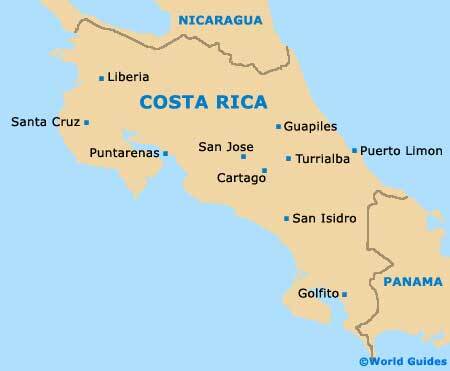 The Republic of Costa Rica is situated within Central America, where it is sandwiched between the countries of Nicaragua (north) and Panama (south-east). To the east, Costa Rica is bounded by the Caribbean Sea, while the Pacific Ocean edges the westerly side of the country. Famed for its beautiful coastline, Costa Rica literally translates in Spanish as 'rich coast' and features dreamy beaches facing both the Caribbean and the Pacific. It is this coastline, as well as Costa Rica's rainforest areas, national parks, mountains and exciting cities, that has resulted in the country's thriving tourism industry, currently worth almost US$2 billion. Costa Rica is also known for its adventure sports and whitewater rafting opportunities, as well as turtle spotting and volcanic lakes. The area known as Caribbean Costa Rica tends to be the least visited, while other notable destinations include the densely populated Central Valley, the Central Pacific and its stunning beaches, the 'dry region' of Guanacaste, and the mountain area known as the 'Plains of the North'. South Costa Rica is where the main rainforest is located, along with some rather tranquil, tropical sandy beaches. San Jose serves as the Costa Rican capital and is an important travel hub, being filled with quality museums and surrounded by lush valleys and mountains. Also of note in Costa Rica are the cities of Alajuela, Cartago, Dominical, Heredia, Liberia, Puerto Limón, Puntarenas and Quesada, along with the national parks of Cahuita, Chirripo, Corcovado, Manuel Antonio and Rincón de la Vieja. Once the Costa Rican capital, before San Jose's rise in status, Cartago was founded in the 16th century. The Basilica of Our Lady of the Angels is a notable highlight and one of the survivors of the past eruptions of the Irazu Volcano. The Caribbean coastline of Puerto Limon proves to be quite the draw for holidaymakers, who come in their droves for the white sandy beach of the Playa Bonita. Primeval rainforests and mangrove swamps are also to hand. Close to the Nicoya peninsula and on the scenic Pacific coast, the Puntarenas area comes with lengthy beaches and favourable surfing conditions. The city itself may be showing its age somewhat, but still manages to draw hordes of tourists. The San Jose of today has evolved greatly over the past 100 years and this cosmopolitan city serves as the capital of Costa Rica. Modern office blocks and shopping malls contrast with the architecture of the historical Barrio Amon area.